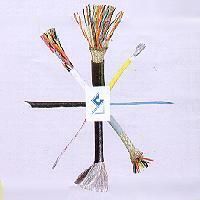 Space Application Cables was formed by a group of three young, enthusiastic, pragmatic engineers. Right from the inception of the company, we have been engaged in the manufacturing capacity is our feather in the cap. We are known for our quality consciousness and quick delivery. Ploy Tetra Fluoro Ethylene PTFE (popularly known as Teflon - a registered trademark for the fluorocarbon resin from M/s. Dupont, U.S.A.), was accidentally invented at the R & D laboratory of M/s. Dupont, U.S.A. in 1936. Today, it is one of the most useful engineering plastics in the world. Its excellent electrical, mechanical, chemical and thermal properties make it an ideal material for most diverse application. We manufacture PTFE Insulated Wire as per American specification MIL-W-16878, British specification BS-G-210 and other equivalent specifications. For India, the product specifications are governed by Joint Service Specification (JSS) 51034, which defines the product for use in three voltage ranges viz. 250 Volts, 600 Volts and 1000 Volts grade.